← Are You B12 Deficient? The team made it through the 90-Day Healthy Weight Challenge and every single one of them lost weight! Combined they lost 159.5 lbs – that is a 4.95% overall loss! They also lost a lot of inches – waists are down 51” and hips 54” – there are lots of baggy clothes around here. If you have been following the challenge you know that each participant had a private assessment with Jacquie Eubanks, the staff nurse who specializes in assessing, developing and coaching to optimize one’s health with the proper use of pharmaceutical grade vitamins and supplements. All participants were given Nordic Naturals ProOmega Lemon fish oil supplement, Douglas Laboratories Multi-Probiotic 15 billion, Enzymedica Digest Gold (a potent digestive enzyme,) and Metagenics PhytoMulti, multivitamin. 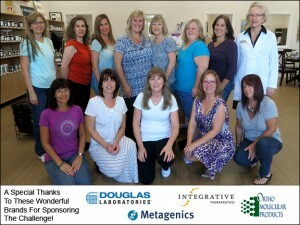 The participants were broken into three groups based on the weight loss supplement that was deemed best for them by Eubanks; and they received either Ortho Molecular CLA that supports reducing body fat while increasing muscle tone – this group lost 3.39% body weight; Douglas Laboratories Super HCA (garcinia cambogia extract) that aids in normal appetite regulation – this group lost 5.19% body weight; or Integrative Therapeutics 7-KETO Lean that helps burn fat, not muscle, and promotes weight loss – and this team lost 6.39% body weight. Another key component to reaching a healthy weight is exercise and boy, oh boy, did the team exercise! They walked/ran 606.5 miles; did 95.5 hours of tai chi, yoga, or ballet; walked dogs 55.22 miles; spent 56 hours on yardwork or house cleaning; and sweated it out in the gym for 29.5 hours; plus 75.25 hours of miscellaneous activities such as swimming and horseback riding. This entry was posted in Home and tagged Week 13: 90-Day Healthy Weight Challenge. Bookmark the permalink.